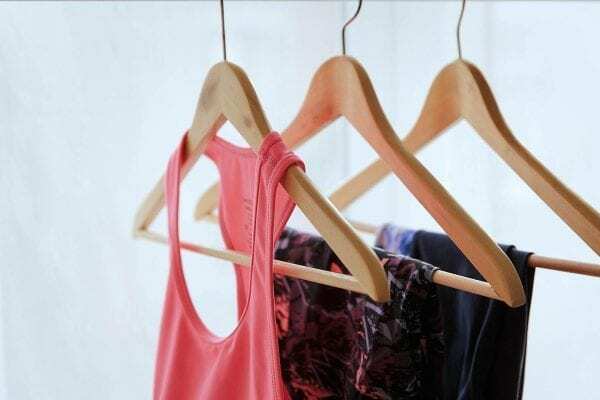 What should i wear to my pilates class? It can be daunting going to your first Pilates class and knowing what to wear is even worse! So what should you wear to your Pilates class, does it need to be expensive Fitness clothing? I have been teaching Pilates for a 17 years and fashions have changed in that time! Things to think about when deciding what to wear! Trousers/ leggings not too baggy. The teacher needs to see your body to check your alignment whilst doing the exercises. Leggings make sure they aren’t see-though! You spend a fair amount of time on your back with your legs in the air! White underwear, see-through leggings need I say anymore! Avoid trousers with a thick waistband as this might dig into you or zips. New to pilates a T shirt is fine, with a sweat shirt over it until you have warmed up. Make sure the T shirt is not too baggy, the teacher needs to see your bodies alignment, it doesn’t need to be skin tight. I would advise wearing a round neck T shirt rather than a low cut one. Some exercises you lie on your front raising your upper body. If you invest in any clothing for pilates buy a sports bra. Sports Bra’s support your breasts during the workout. If they aren’t properly supported then it can lead to tissue damage, stretching of ligaments and scarring which can’t be reversed. Sports bra’s vary depending on your size and the support you need. Why not give this quiz ago and see what size you should be wearing! During Pilates you don’t wear shoes, only to get to the class! You can get non-slip socks but starting out its fine to wear normal socks. Yes men do Pilates too!! There isn’t a lot of pilates clothing around for men at present. yes its fine to wear shorts to pilates, but have pity on your teacher! You spend time on your back with legs in the air, so wear tight fitting shorts with baggy over the top or longer length shorts! Overall it’s about wearing layers, so you can strip off as you get warm. If you haven’t found the pilates class for you yet check out our blog to help you make sure it’s the right one for you! motivation, accountability and Pilate’s stuff! PreviousPrevious post:Finding the right Pilates class for you!NextNext post:Pilates practise at home.